Not Another New Revit Blog!!! 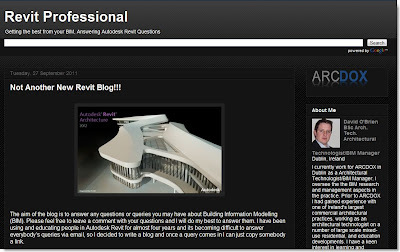 David O'Brien Technologist and BIM Manager at ARCDOX in Dublin, Ireland has created blog site called: Revit Professional. Check it out here! The aim of the blog is to answer any questions or queries you may have about Building Information Modelling (BIM). Please feel free to leave a comment with your questions and I will do my best to answer them. I have been using and educating people in Autodesk Revit for almost four years and its becoming difficult to answer everybody’s queries via email, so I decided to write a blog and once a query comes in I can just copy somebody a link. Revit APP Blog - Information on Revit APP.